While cachet comes with saying you’ve traveled to Venice, Paris, and other fashionable venues, it’s surprising how many historic places are within driving range. In the course of writing seven books about South Carolina, I’ve been to spots and secret places with appeal all their own, and I’ve learned something: you don’t have to go abroad to experience marvelous places nor do you need to flock to the clichéd “must see” venues. Rustic beauty, natural areas, history, and interesting sights and places surround the Midlands. Living in the Midlands, in fact, puts you in an ideal place to strike out and explore South Carolina. Few cities have three interstates running through them. 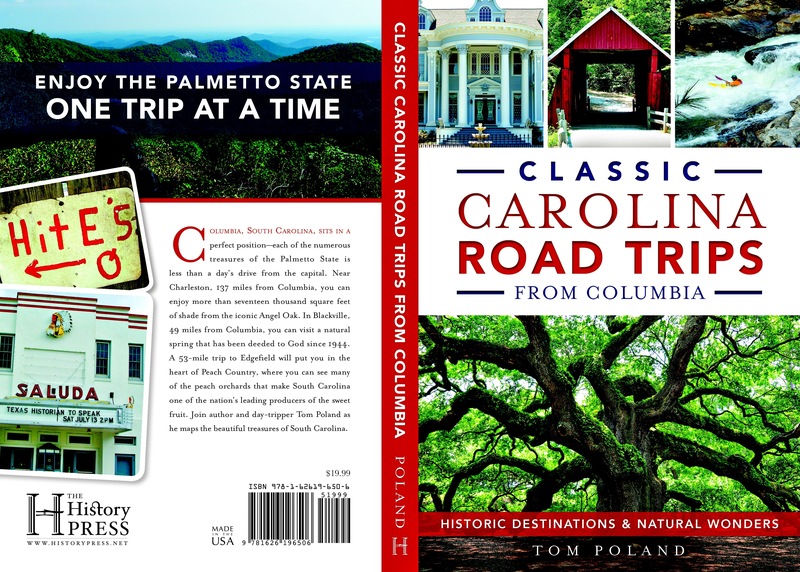 An interstate can quickly take you to more interesting byways that course through the heart and soul of South Carolina. For instance, take I-20 and head east, and near Camden you can take side roads that lead to Highway 261, the Kings Highway. Travel that tree-shaded lane and you follow the footsteps of two armies not to mention a famous Civil War diarist who lived along its shoulders. Much awaits discovery. When I pick up a map of South Carolina I don’t see colored lines and legends. I see artisans who craft beautiful and useful things. I see waterfalls and raging whitewater. I see oaks of legend, a covered bridge, a drive-in theater, and North America’s only tea plantation. I see vanquished civilizations, forgotten monuments, abandoned dreams, and evidence of man’s passion for conquering—then abandoning—his surroundings. If you like Rome’s ruins, you will love Old Sheldon Church, Glendale, the Chapel of Ease, and Fort Fremont. Curious about the land your forbears knew? Then go back in time to see what this country looked like before we cut, dug, and burned so much of it. Visit our national wildlife refuges and one national park. I see nature in all its glory. Geology blessed South Carolina with mountains, rivers, beaches, plains, and mysterious wetlands known as Carolina bays. I see a culture that overflows with things beautiful thanks to artists, sculptors, basket makers, potters, and long-gone European stonemasons who graced the state with the products of their imaginations. Seeking adventure? Would you like to say you’ve walked the state at sea level and stood on her rooftop? Well you can. To explore is to take back roads. Those familiar with my work will tell you I appreciate interstates as a speedy way to get from point A to B, but no one takes a journey on an interstate. Whenever you can, take the back roads. Take a highway like Highway 261 where a historical marker greets travelers: “Over it came Indians, pack animals laden with hides, drovers, rolled hogsheads of produce, wagoners, and stagecoaches.” Now that’s the kind of road I want to travel. The best thing about day trips is that you can avoid the crowd. You won’t find yourself surrounded by hordes that go to a place just to say they went. A day trip to Campbell’s Covered Bridge, for instance, rewards you with solitude, beauty, and the opportunity to explore all you want, and best of all there’s no need to stand in line. Columbia is in a fortunate place: dead center the state. Plan your day trips and strike out with a camera, a GPS device, and a desire to explore. Adventure’s just around the corner, so much so that you can postpone that trip to Rome’s ruins. We’ve got ruins of our own. Any book like this one needs to be accompanied with a caveat. Places close. Hours, fees, and services change or vanish, but it’s never been easier to get updated details. Check ahead to be sure your adventures go as planned. One final note … I’m using the address of the South Carolina State House, 1100 Gervais Street, Columbia, SC 29201, as a central point for estimating time and distance to venues. Depending on where you live, you can estimate your time and distance or MapQuest it. Strike out and explore historic destinations and natural wonders.